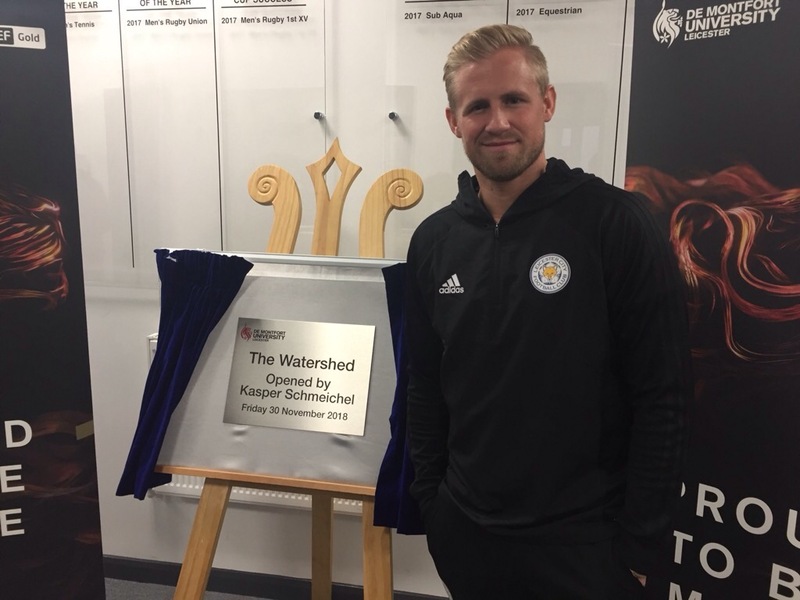 Leicester City superstar goalkeeper Kasper Schmeichel officially opened De Montfort University’s The Watershed this afternoon (FRI, NOV 30). The Watershed is the building which houses the university’s sports department, as well as the strength and conditioning facilities. 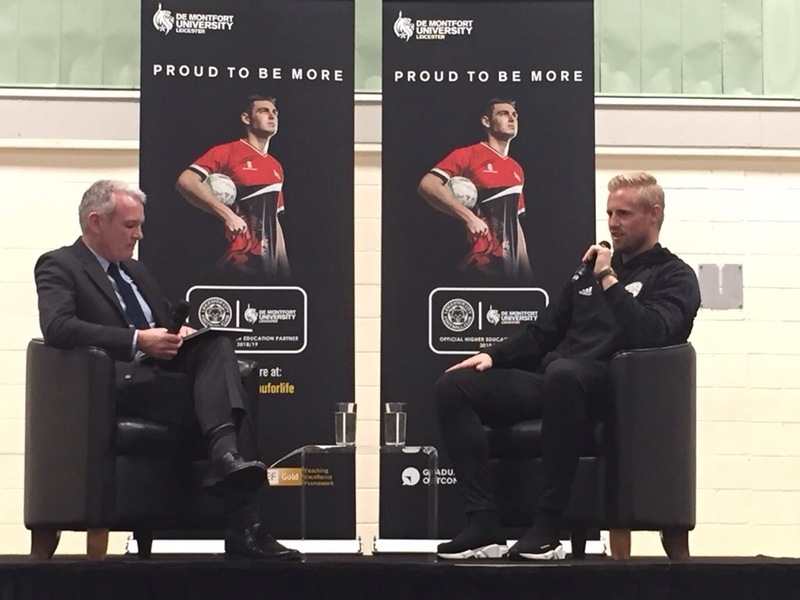 After unveiling the plaque, Schmeichel sat in for a Question and Answer session with students and some local young footballers. The Q&A was hosted by Professor Martin Polley, the Director of the International Centre for Sports History and Culture. Above – Professor Martin Polley talks about the event. Dylan Durbin, 22, a lifelong Leicester fan and DMU student, said: “It’s great to see such an important player from the club getting involved in the uni. SAFE HANDS: Kasper Schmiechel unveiled the plaque as he officially opened The Watershed. Throughout the session Kasper answered questions about being a goalkeeper, the World Cup, winning the Premier League and his relationship with the late Leicester City Chairman Vichai Srivaddhanaprabha. As well as Professor Polley, many fans from the crowd were given the opportunity to ask questions to the Leicester City number 1. One young goalkeeper in the crowd asked the Danish international if he had any advice for someone playing that position. “Enjoy it, that’s the main thing. Make sure you have fun. Don’t be nervous, just enjoy yourself,” he advised. When asked about playing for Leicester, he said: “I’d played at a lot of clubs, but from the first day here it felt different. Kasper spoke very passionately about the legendary 2015/16 season, in which Leicester won the Premier League, and what it was like during the last week of the title race. “Obviously it was amazing, but at times it felt awful, it was so close and we just wanted to follow through. It might sound ridiculous but I was frustrated we didn’t seal it sooner. “We had the chance to end it at Old Trafford. I guess it shows just how far we’d come that we were disappointed with a draw away to Manchester United, because we hadn’t won the Premier League yet. 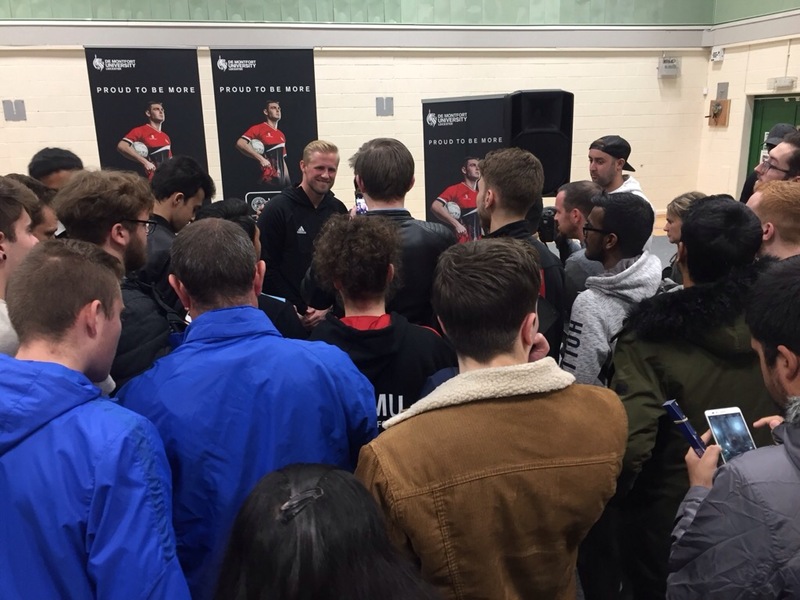 After the event came to a close, Schmeichel patiently stayed behind for half-an-hour to get photos with fans and staff, sign autographs and chat to people. FAN FAVOURITE: The Foxes’ keeper stuck around until every selfie was taken, every hand shaken, and every shirt signed. Leicester City are at home against Watford FC in the Premier League tomorrow (DEC 1).